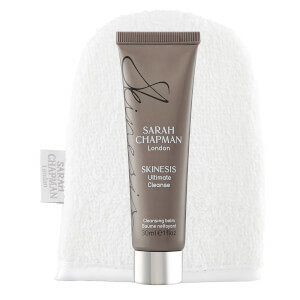 Create the skin of your dreams with Sarah Chapman Skinesis The Seasonal Sparkle Gift Set, a collection of five products to help you cleanse, hydrate, soothe and firm for a visibly youthful complexion. Intelligent, luxurious anti-ageing balm to milk cleanser enriched with collagen stimulating peptides, vitamin A, potent antioxidants & omega rich oils. Deeply cleans, softens, soothes and brightens, removing makeup. Developed for our professional facials, our unique dual sided mitts are perfect for gently exfoliating the skin and effectively removing face and eye makeup, to reveal brighter, smoother, cleaner skin. This innovative mask envelops the face like a second skin to instantly hydrate, plump and soothe redness with its formulation of moisture magnets and skin defence actives. Using advanced bio-cellulose technology for superior absorption of intense hydrators, Pentavitin® and hyaluronic acid. Dull, dehydrated skin is restored, radiant and plumped up with moisture. This award-winning daily protective moisturiser targets the first signs of ageing, supports a healthy skin and delivers a healthy, glowing complexion with our unique triple brightening skin complex and potent skin defence antioxidants. This innovative formula with SPF 15, UVA and UVB filters protects against oxidative stress and UV-induced damage. Multi award-winning skin transforming, night-time elixir recreates the lifting, firming, skin perfecting benefits of a Skinesis facial. Awaken to plump, smooth, rejuvenated skin with a signature Skinesis glow. 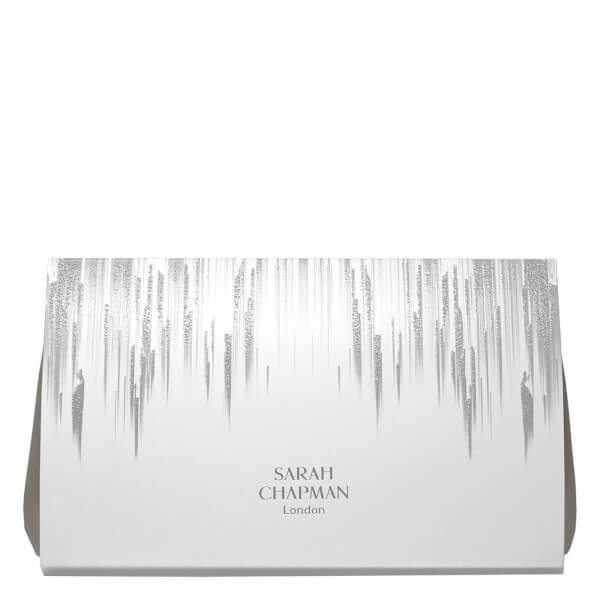 Cleanse: Massage 1 pump onto dry skin (including eye area) allowing the balm to melt all impurities and make-up. Emulsify to a milk with warm water and sweep away with wet Professional Cleansing Mitts. Mitt: Soak mitts in warm water, slot over 4 fingers and use to wipe away cleanser, make-up and grime gently exfoliating. Use the fine side for eye make-up removal. Moisturiser: Smooth 1-2 pumps of Dynamic Defence over face, neck and chest every morning after your serum or elixir. Facial: Smooth 2 pumps of Overnight Facial over your face and neck, inhale the heavenly scent then enhance with our Skinesis signature massage. Cleanse: Isopropyl Palmitate, Caprylic/Capric Triglyceride, PEG-20 Glyceryl Triisostearate, Cetyl Ethylhexanoate, Sorbitan Oleate, PEG-10 Laurate, Hydrogenated Castor Oil, Prunus Amygdalus Dulcis (Sweet Almond) Oil, Ceteareth-6 Olivate, Beeswax (Cera Alba), Decyl Glucoside, Simmondsia Chinensis (Jojoba) Seed Oil, Crambe Abyssinica Seed Oil, Limnanthes Alba (Meadowfoam) Seed Oil, C12-15 Alkyl Benzoate, Stearalkonium Hectorite, Cinnamomum Camphora (Camphor) Bark Oil, Water (Aqua), Limonene, Propylene Carbonate, Tribehenin, Ethanol, Ubiquinone, Tocopheryl Acetate, Citrus Aurantium Amara (Bitter Orange) Flower Oil, Eucalyptus Globulus Leaf Oil, Linalool, Cananga Odorata Flower Oil, Citrus Aurantium Bergamia (Bergamot) Fruit Oil, Cedrus Atlantica Bark Oil, Citrus Aurantium Dulcis (Orange) Peel Oil, Citrus Nobilis (Mandarin Orange) Peel Oil, Citrus Limon (Lemon) Peel Oil, Citrus Aurantium Amara (Bitter Orange) Leaf/Twig Oil, Lavandula Angustifolia (Lavender) Oil, Ceramide 2, PEG-10 Phytosterol, Adansonia Digitata Seed Oil, Borago Officinalis Seed Oil, Rosa Canina Fruit Oil, Lilium Candidum Bulb Extract, Glycerin, Anthemis Nobilis Flower Oil, Myrocarpus Fastigiatus Oil, Jasminum Officinale (Jasmine) Flower Extract, Geraniol, Rosa Damascena Flower Oil, Acacia Decurrens Flower Extract, Retinyl Palmitate, Palmitoyl Hexapeptide-12. Mask: Aqua, Glycerin, Butylene Glycol, Rosa Damascena Flower Water, Saccharide Isomerate, Isoamyl Laurate, Aloe Barbadensis Leaf Juice, Polyglyceryl-10 Oleate, Phenoxyethanol, Hyaluronic Acid, Parfam, Xanthan Gum, Mannitol, Polyglyceryl-2 Oleate, Allantoin, Carbomer, Dipotassium Glycyrrhizate, Triethanolamine, Sodium Citrate, Octyldodecanol, Peg-60 Almond Glycerides, Caprylyl Glycol, Ribes Nigrum Seed Oil, Iodopropynyl Butylcarbamate, Sclerotium Gum, Acetyl Tetrapeptide-15, Helianthus Annuus Seed Oil Unsaponifiables, Potassium Sorbate, Sodium Benzoate, Magnesium Aspartate, Zinc Gluconate, Cardiospermum Halicacabumflower/Leaf/Vine Extract, Helianthus Annuus Seed Oil, Tocopherol, Copper Gluconate, Nordihydroguaiaretic Acid, Oleanolic Acid, Rosmarinus Officinalis Leaf Extract, Benzyl alcohol, Citral, Citronellol and Geraniol. Moisturiser: Water (Aqua), C14-22 Alcohols, Ethylhexyl Methoxycinnamate, Ethylhexyl Salicylate, C12-15 Alkyl Benzoate , Glycerin, Benzophenone-3, Dimethicone, Rumex Occidentalis Extract , Butyl Methoxydibenzoylmethane, Octocrylene, C12-20 Alkyl Glucoside, Cetyl Alcohol, Crambe Abyssinica Seed Oil , Glyceryl Stearate, PEG-100 Stearate , Phenoxyethanol, Arctostaphylos Uva-Ursi Leaf Extract , Hydroxyethyl Acrylate/Sodium Acryloyldimethyl Taurate Copolymer, Sodium PCA, Mangifera Indica (Mango) Seed Butter, Butyrospermum Parkii (Shea) Butter, Nylon-12, Phyllanthus Emblica Fruit Extract , Caprylyl Glycol, Squalane, Polysorbate 60 , Lecithin, Plankton Extract , Butylene Glycol , Yeast Polysaccharides , Xanthan Gum, Ubiquinone , Ethylhexylglycerin, Tocopheryl Acetate, Hexylene Glycol, Cedrus Atlantica Bark Oil, Jasminum Officinale (Jasmine) Flower Extract, Parfum, Triethanolamine, Iris Florentina Root Extract , Rosa Canina Flower Extract , Disodium EDTA, Diethylhexyl Syringylidenemalonate , Fusanus Spicatus Wood Oil, Pelargonium Graveolens Flower Oil, Rosa Damascena Flower Oil, Citronellol, Geraniol, Linalool, Benzyl Benzoate, Farnesol, Retinyl Palmitate, Benzyl Cinnamate, Benzyl Alcohol, Eugenol, Hydroxycitronellal, Citral. Facial: Simmondsia Chinensis (Jojoba) Seed Oil, Cetearyl Ethylhexanoate, Cyclopentasiloxane, Cyclohexasiloxane, Di-PPG-2 Myreth-10 Adipate, Caprylic/Capric Triglyceride, Tetrahexyldecyl Ascorbate, Ethylene/Propylene/Styrene Copolymer, PEG-4, Phenyl Trimethicone, Limnanthes Alba (Meadowfoam) Seed Oil, Crambe Abyssinica Seed Oil, C12-15 Alkyl Benzoate, Cannabis Sativa Seed Oil, Butylene/Ethylene/Styrene Copolymer, Tocopheryl Linoleate/Oleate, Tocopheryl Acetate, Hydroxycinnamic Acid, Ubiquinone, Tribehenin, Teprenone, Retinyl Palmitate, Ceramide 2, PEG-10 Phytosterol, Thioctic Acid, Palmitoyl Hexapeptide-12, Adansonia Digitata Seed Oil, Cedrus Atlantica Bark Oil, Parfum, Jasminum Officinale Flower Extract, Santalum Spicata Wood Oil, Citrus Paradisi Peel Oil, Pelargonium Graveolens Flower Oil, Cananga Odorata Flower Oil, Rosa Damascena Flower Oil, Dalbergia Sissoo Wood Oil, Anthemis Nobilis Flower Oil, Lavandula Angustifolia Oil, Citrus Aurantium Bergamia Fruit Oil, Linalool, Limonene, Benzyl Benzoate, Citronellol, Geraniol, Farnesol, Benzyl Cinnamate, Benzyl Salicylate, Eugenol, Benzyl Alcohol, Citral, Hydroxycitronellal.